If you haven’t noticed GoDaddy has gone through a transformation in the last few years. GoDaddy leadership talk candidly about how their prior brand strategy generated a lot of attention but alienated a lot of their customers. GoDaddy realized most of its customers were actually female small business owners. GoDaddy’s new CEO Blake Irving has worked hard to shift its strategy to “represent them [women] proudly.” Today GoDaddy has many strong female leaders running the company including Barb Rechterman, Chief Customer Officer. GoDaddy has become a more customer-centric company. I know because I personally am a customer. Now when you call their call center a voice says “need customer support? 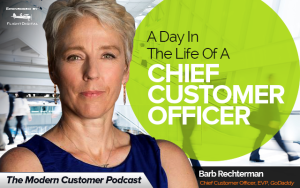 We love helping customers.” Chief Customer Officer Barb has been instrumental in overhauling GoDaddy’s customer experience. Barb is not just a customer advocate she’s also a dynamic person outside of work who rides Harley motorcycles and trains her horses in her spare time. Hear about how this Chief Customer Officer makes a huge impact within one of the world’s most popular brands.